Our range of suit styles includes black or navy medium weight self stripe herringbone jackets and can be worn with matching trousers or grey / navy stripe trousers. We also stock lightweight plain black jackets which also come with their own matching lightweight trousers or can be worn with traditional grey stripe trousers. 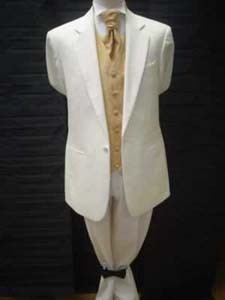 Cream suits are also available. 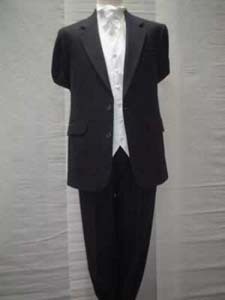 Suit styles can be dressed up with a wing collar shirt, waistcoat and cravat or some grooms prefer to go for a less traditional wedding look and wear regular collar shirt and tie.